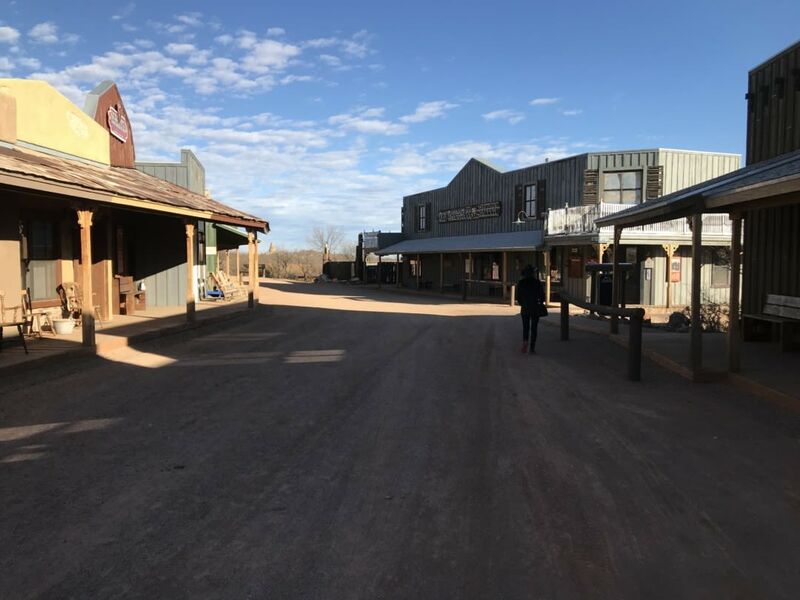 Visiting Tombstone, Arizona: Git Your Cowboy On! Gun slingers still haunt this Old Western town. The Old Tombstone Western Theme Park, home to a fun gun fight show. The most famous western shootout in American history lasted less than 30 seconds. Almost 140 years later, the town of Tombstone, Arizona relives the gun battle between Doc Holliday, the Earp brothers and “the cowboys” every day. Visiting Tombstone is like being at a cowboy Renaissance festival where you’re not sure who’s acting and who just really, really likes to pretend to live in the 1800s. Unlike Deadwood and other famous Western towns, the main drag of Tombstone is made of dirt and only allows foot traffic and horses. It’s about as authentic as you can get to a real cowboy town in the 21st century. 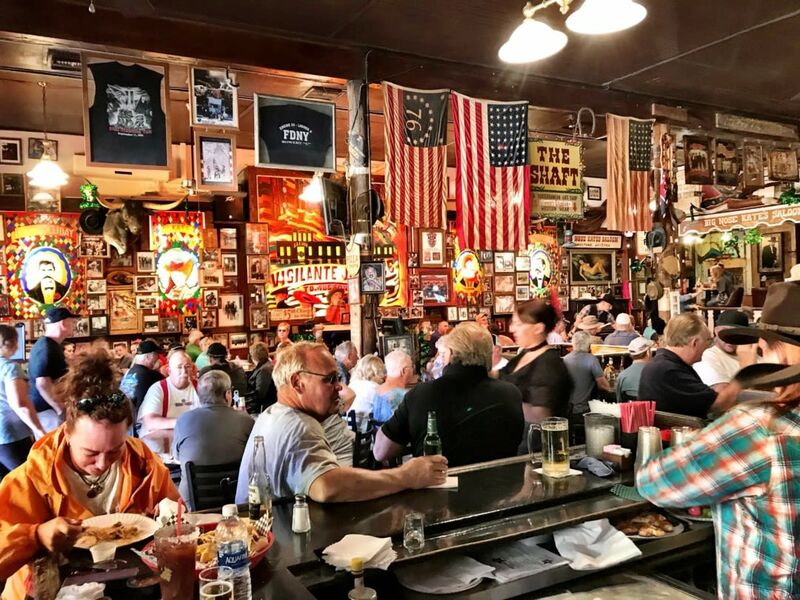 The most popular place to eat and drink is Big Nose Kate’s Saloon built on the ruins of the 1891 Grand Hotel. When you walk into the bar, you won’t be disappointed. 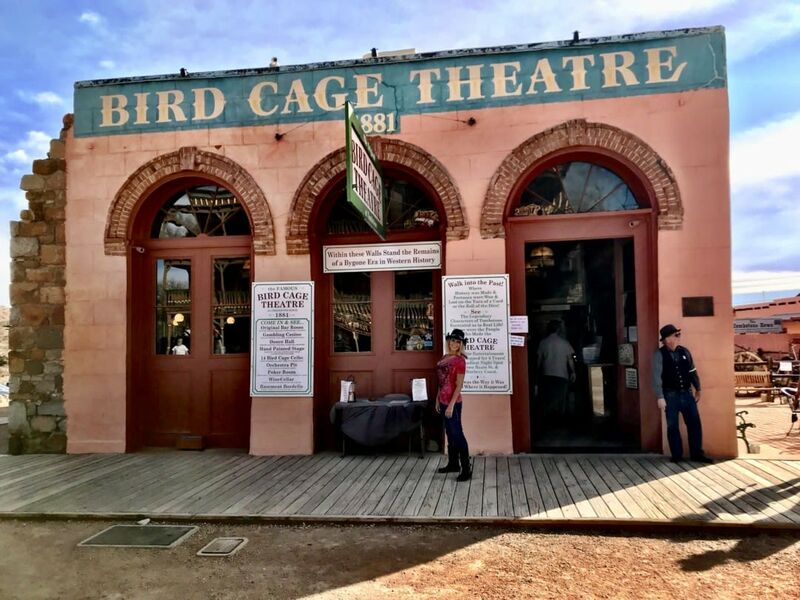 There are no gunfights or poker players, but you will find live entertainment, stained glass windows that look like they survived a century or two, and some real cowboys strolling around. Whether they work there or not is anyone’s guess, but there’s a lot of authentic characters who look like the real deal. No one seems to care that they’re carrying either real guns or very good copies of real guns. 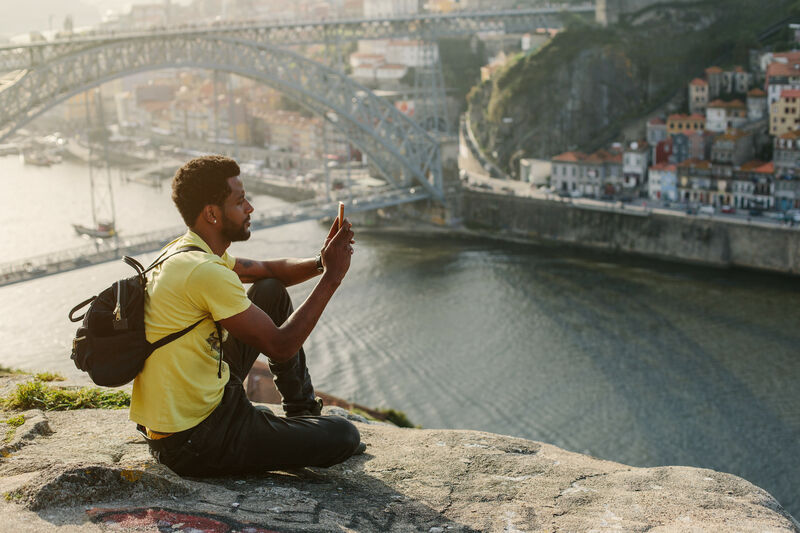 There’s lots of locals around who are happy to tell you a ghost story or some town gossip. You can also head downstairs to see the Swamper’s mine entrance, where a hotel worker secretly chiseled his way into the silver mining catacombs and is believed to still haunt the area. I stayed in a gem of a place called Monument Guest Ranch, a five-minute drive outside of the main part of town. 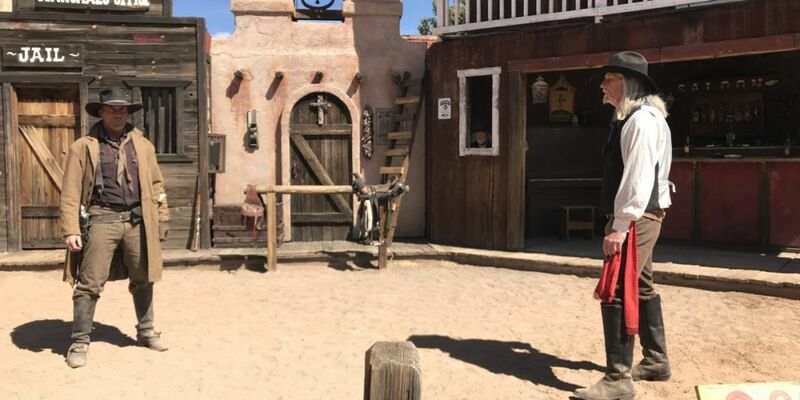 It’s a recreation of a Western town that looks better than most movie sets I’ve visited, complete with a dirt main street, hitching posts for your horse, a jail, a brothel, a saloon—pretty much anything that you’ve ever seen in a cowboy movie. Here’s the cool part: You can stay in the courthouse, the brothel, or any of the other buildings. It’s a real hotel on the inside, decorated historically, but you won’t have to worry about enduring the 1800s lack of electricity, water, TV, WiFi or other amenities. The hotel is really set up for an all-inclusive experience with horse-riding, archery, shooting, and all your meals, but you can also book it as hotel with breakfast if you want to put together your own schedule. One of our breakfasts was prepared on the campfire while the resident cowboy cook told stories about the town and the Old West. He offered us the good coffee and poured it out of a metal pitcher that looked like something John Wayne might have owned. If you decide to ride horses, you can ride down the street and park your steed outside your hotel room. How cool is that? I wouldn’t stay anywhere else. It’s your own private Westworld. Just a few minutes walk down a dirt road is the memorial of Ed Schieffelin, the founder of Tombstone. Ed was a prospector looking for silver and gold during a time when the area was notorious for Apache violence. When his associates learned of his attempts to work in such a dangerous area, one was quoted as telling him that the only stone he was going to find was his own tombstone. Once Ed found silver, he brought in his brother Al and a silver expert as partners, and the rest is history. 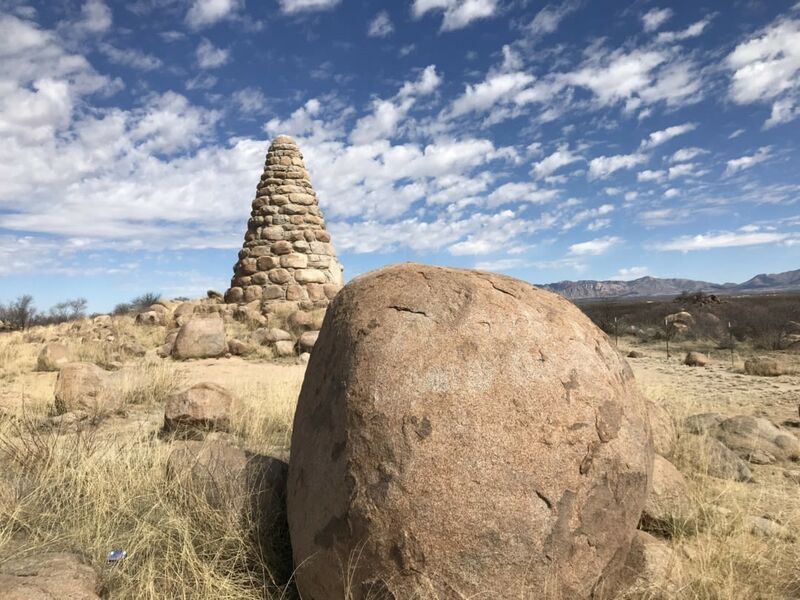 It is my wish, if convenient, to be buried in the dress of a prospector, my old pick and canteen with me, on top of the granite hills, about three miles westerly from the City of Tombstone, Arizona, and that a monument, such as prospectors build when locating a mining claim, be built over my grave. Ed’s grave can be visited to this day, and no one is really sure if he is lying down or standing up in the pile of boulders. Boot Hill is the famous cemetery in town that was named for those buried here who died with “their boots on." 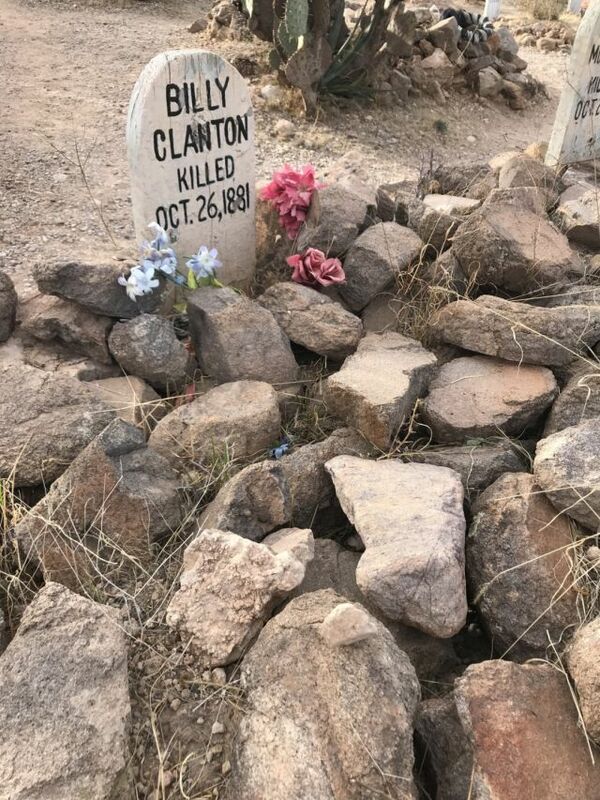 There’s a lot of unknown people lying in this graveyard, but the two McLaury brothers and Billy Clanton from the OK Corral shootout found their final resting place here. Boot Hill didn’t seem very authentic to me because of the uniform piles of rocks and whitewashed wooden crosses that would have never survived a century of exposure to the elements. The handwriting also appears to be uniform, a little too perfect, and some are even done with a felt marker. I’m pretty sure Sharpies didn’t exist then, but regardless, Boot Hill is one of the most notable cemeteries in the US (in spite of its Hobby Lobby looks) and only takes a moment (and $3) to say you’ve seen it and cross it off the list. 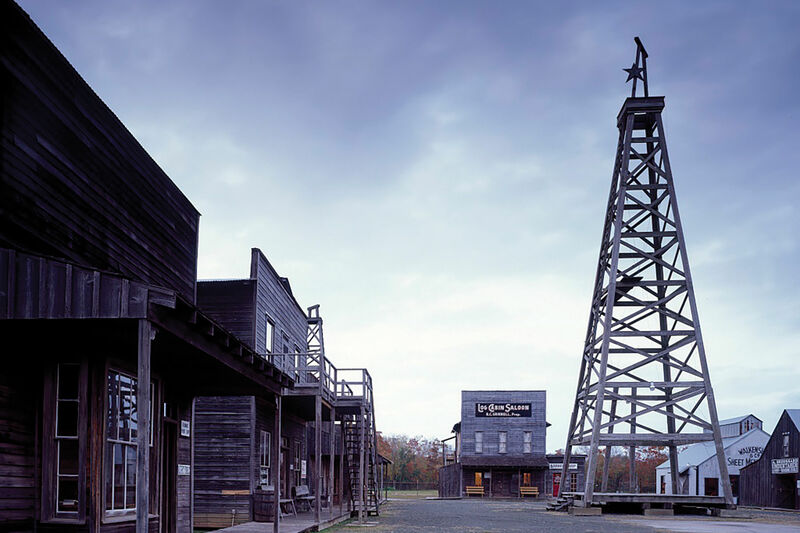 A few blocks away is the Old Tombstone Western Theme Park that features a gunfight that is not historical, but hysterical. Part stunt show, part gun fight (everyone survives), this show is the perfect place for families to have some great laughs. Solid acting and a funny script that doesn’t take itself too seriously makes you feel unsure if there are mistakes and detours from the show or if that’s just part of the fun. This was one of my favorite places in Tombstone. I met one of the actors later as he was moonlighting as a ghost tour guide. Cowboys can’t make a living just shooting people it seems. You need a night gig to pay for all those bandanas. I didn’t make it to the Tombstone ghost tour, but the town does have a haunted history and the ghost hunts garner good reviews. Welcome to the Bird Cage. Speaking of haunted, the Bird Cage is one of the original buildings still standing in town. At one time it was a theater, saloon and brothel that stayed open 24 hours a day, 365 days a year and had a reputation for being one of the most sinful venues in the country. When the silver boom suddenly stopped, many residents left Tombstone and the building was closed and unopened for over 40 years. When a new owner purchased it in 1934, he was surprised to see that the building was practically a time capsule, with everything left as it was in 1892. The theater has a jaded history, is full of bullet holes and lots of ghost sightings. You can walk in the front of the building for free or do a full tour or ghost tour that includes 30 minutes of standing in the dark listening and watching for the paranormal. The Bird Cage has been featured in many ghost hunter shows, so there must be something to the legends. Tombstone offers special events throughout the year. Last August, Val Kilmer showed up as a guest for Doc Holli-Days and it’s rumored that other Tombstone stars will appear at the 2018 offering. There are Freeedom Days, Helldorado, and other events that cover almost every month of the year. 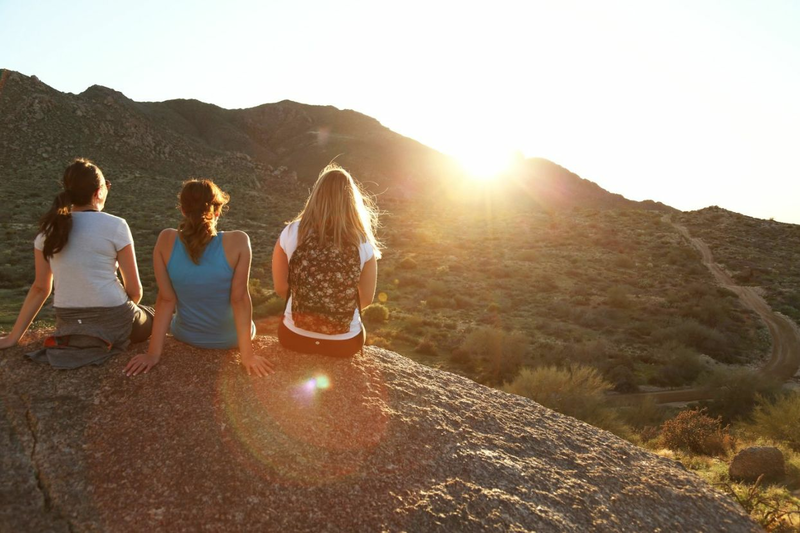 Tombstone can be combined with a visit to the nearby charming town of Bisbee, Tucson, or Saguaro National Park.